Do you want to increase your confidence and learn to overcome your fear of speaking in public? Are you interested in meeting new people? Do you need to improve your presentation skills? We can help you achieve all that… and more, by learning the art of Public Speaking! Joining Lutterworth Speakers Club will enable you to acquire these skills in a friendly and supportive environment. Learn to speak at your own pace as your confidence grows. Few skills impact on your life more positively than learning to speak in public. Most importantly, it’s a lot of fun and you’ll make some good friends too. If you don’t believe that PUBLIC SPEAKING can ever be fun, come along and see for yourself. Laughter is guaranteed! Why not come along as a guest and see for yourself? Contact us now… it could be the best thing you ever do! To enquire about visiting the club, or membership, feel free to email our Webmaster, Allan Rimmer, at speakersclublutterworth@gmail.com or call Allan on 01455 324495. 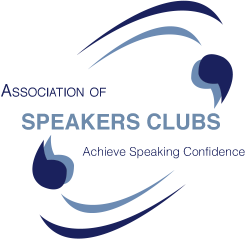 The Association of Speakers Clubs was formed in 1972 and currently has 100 clubs throughout the UK. This means that members of Lutterworth Speakers Club have the backing of a national organisation together with the benefits of a small local club.